Comments: Part of the 1732 land grant to Edward Scott, Glendower lies "on the north side of the River Fluvanna (now called the James River) at a place called Totier." The estate was known as Scott's Mill and later as Dyer's Mill when Samuel Dyer of nearby Plain Dealing purchased it. It is possible that Samuel Dyer built the present dwelling at Glendower in about 1808. The house was constructed of dark red brick with double colonial porches at each end. In 1867, Glendower was sold to William Gordon Merrick, whose home it was for more than forty years. Merrick was an agent for the James River Valley Migration Society, who sought 'intending settlers' for Albemarle County after the Civil War. This Glendower photo is from the Eleanor Evans collection. Eleanor resides in Suffolk, Virginia, and is the granddaughter of Archibald Douglas Kincaid and his wife, Lucy Mason Holladay. 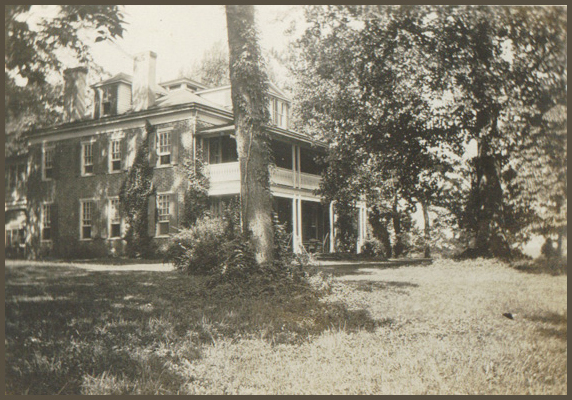 Glendower was the childhood home of Mary Eleanor (Dillard) Holladay, Lucy's mother.